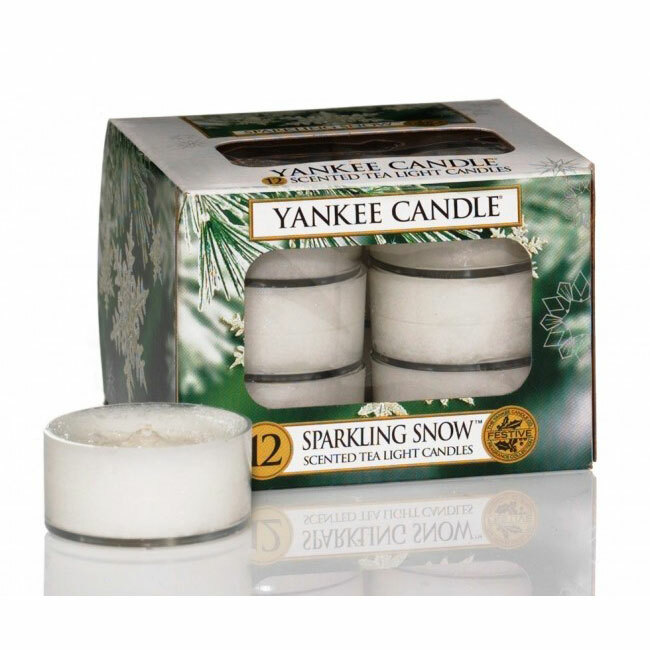 Yankee Candle ® Tea Lights (Pack of 12) Sparkling Snow seasonal scent delivers a crisp, naturally fresh aroma of gleaming snow-covered pines. Yankee Candle's smallest candle form, Tea Lights, conveniently add candlelight to any room, and add instant impact to any space when used in multiples. The wicks safely extinguish once all the wax has been consumed and a perfect match for Yankee's decorative accessories which can be illuminated by this smallest candle. Yankee's famous fragranced oils create true-to-life candle aromas that touch the senses like the real thing. Sparkling Snow essence transports you to the highest snow-tipped mountain where the naturally fresh scent of powdered snow awakens your senses. Calm and relaxing aroma leaving the room feeling cleansed and comforting.